Family Volley: FAMILY FUN FRIDAY! Bear, Hunter, Maiden. FAMILY FUN FRIDAY! Bear, Hunter, Maiden. 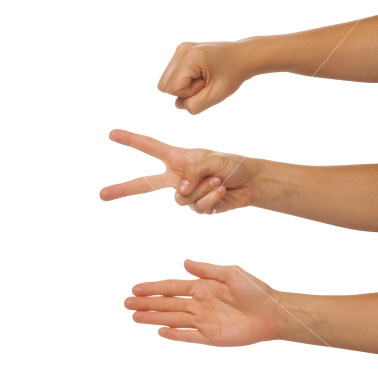 Today's Family Fun is a throw back to Rock, Paper, Scissors. The perfect family game, No Materials Required. BEAR: Hands up in claw-like position, "GRRRR"
HUNTER: Pretend to hold a gun, "BANG"
MAIDEN: One hand on your head, the other hand on your hips, "WOOOO!" Count one, two, three and show your new sign. Be sure you make the "sound" as you show your sign. How to Win: BEAR eats MAIDEN, HUNTER shoots BEAR, MAIDEN woos HUNTER. This game is perfect for kids. They love the signs and the sounds that go with them. It also teaches them to think ahead and problem solve. Wait until you see your husband "WOOO" like a maiden with his hands on his hips. Or your 2 year old "GRRRR" like a bear. Hilarious. ****This is also fun to play with large groups. Divide everyone into two groups. Designate an area of play with two safety lines on opposite ends, with a challenge line in the center. Group members agree on which character they will be (Bear, Hunter, Maiden). Once each team has chosen an action, they line up, team A facing team B, on the challenge line. Count to three and then the two teams do the actions "at" each other. If one team beats the other, the winning team chases the losing team to their safety line. If someone on the losing team gets tagged by the winning team before crossing their line of safety, they become part of the winning team. If both teams choose the same action then they go back to their huddle and choose a new action. This is repeated until one team is taken over by the other team. Have a Great Weekend. It is a big one for us. Our son is getting baptized on Saturday. *P.S. Don't forget to enter the $50 GIVEAWAY. There is still time. Oh wow- congratulations to you and your son. I hope you have a lovely weekend. Thank you for the congrats. We are really excited. Love this idea! I made my husband play it with me just now to see how it worked. My kids are still too young for it but I will do my best to remember. Stopping by from Mingle Mondays! Come check out my blog and follow back!